Merry Christmas wishes from me and kitten <33! and here is the scan that we decided on =]. VECTOR | so i started on this like a few days ago. argh that hair took me like 2 hrs per person, because i wanted to do vk hair as great as sin-chan, its not as good but im still proud of it XD. i'm so glad i didnt choose a long hair bw scan because i would have just died. anyone who correctly guesses how many colors i used gets a cookie. and ignore the painting on the clothes, i redid it with these really cool colors but it didnt mesh and then i was too lazy to redo it. Always you vector are so Gorgerus! This my Fav Couple!im so happy!for this passionete! Vector! Kaname-senpai & Yuki looks soo delicates!FantastiC! Anotehr great work of yours! and I think the wood looks great! but I'll aways cheer for Yuki and Zero o.
I love the color it looks a lot with the original colors I love your work! Wow! I really like this wallpaper. Very nicely vectored! I was never too much of a KanamexYuuki fan but this wallpaper is just too amazing to not click. XD Good work! This is a really amazing wallie! The vectoring and the background.. It's Pretty and really breath-taking! nice wallpaper! maybe a little more shading on the hair, but it's still a great job, vitaamin-san and kitten congrats! Wow! 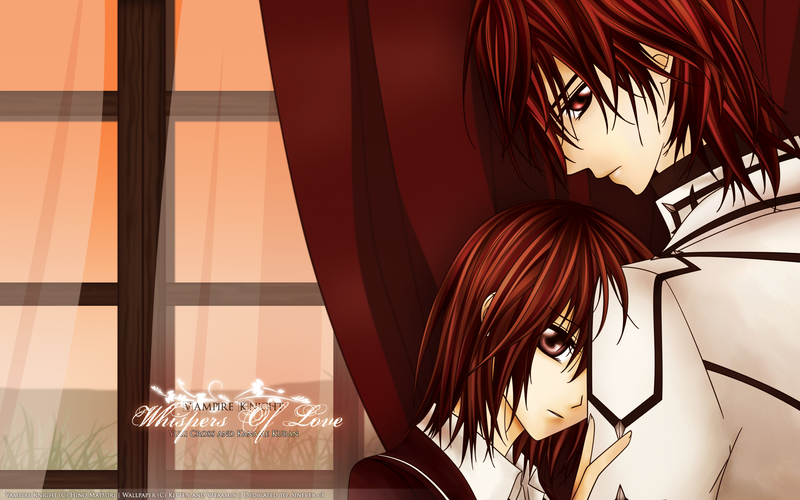 Vampire Knight...I thought you didn't like the art from VK...:-O :-)))) I definitely, positively LOVE this anime. And I haven't decided between Zero or Kaname (they're both handsome and sometimes I find Zero more expressive than Kaname, but I just can't decide)...So I love the choice of characters. This time I can't be critical...I'm SO not objective. I love the colouring used for this wall. It looks great on the desktop. Their hair is just great. Walls and vectors with great details are just my favs (but I think you already know that). I also like the way their eyes are drawn and the light in them (so to speak). It's perfect. The VK eyes are special (a bit large, they first reminded me of beetles, but also very expressive), just like a trademark. So because of the subject, the characters, one of my fav animes, the great drawing and the delicate, original colouring: it's a fav! Sorry, next time I will try and be more critical :-X But I just melt in front of Kaname & Yuuki. This is a great gift, not only for Sin-chan, but also for all VK fans. So a big thanks to both of you, Vitaamin & Kit-chan! Great job! I love this wall of yours!